The first tangible piece of the PS4 may have just meandered online, thanks to an unnamed source and the publishing powers of the internet. 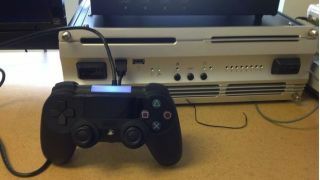 The part in question is the PS4's controller, and although it's there in full plastic form, by all accounts the image is of an early prototype. We could see something quite different when Sony presumably debuts the new system Feb. 20. Destructoid got ahold of the image, featuring a touchscreen-equipped controller plugged into what appears to be a development kit. It's certainly rough looking - bulky with hard-cut buttons and an all black and honestly boring finish. The one bright spot - literally - is the glowing blue/violet light on top, which looks exactly like the PlayStation Move orbs. Definitely some motion-control shenanigans going on there. Aside from the touchpad, the other differences between the prototype and Sony's standard DualShock controller are noticeable though not necessarily radical - except for that glowing mass, of course. The directional pad looks beefier, while there's also a barely there button above and to the right of the pad. The analog sticks also dip in at the top, while there are tiny holes in between that might house a speaker. Again, this is apparently an early prototype so much could have changed between this version and what Sony ultimately unveils, but the leak at least gives us a sense of the direction Sony is likely heading. We will cover the company's New York event on the ground next Wednesday, so stay tuned for the latest announcements and first hands on with what we can only imagine will be Sony's next-gen console.